There are times that I worry about Ubisoft. I’ve made it abundantly clear in the past that I’m not a huge fan of open-worlds that have no real sense of purpose. Particularly ones that feel like they’ve just been crammed full of busy work. This isn’t to say that, technically, previous Ubisoft titles like Ghost Recon Wildlands or The Crew 2 weren’t at least decently playable. So how does Far Cry New Dawn fit into this? The devil’s in the differences. Where I’ve found myself truly enjoying and getting engrossed into a Ubisoft game is when they’ve put something that has that X factor, for lack of a better term. 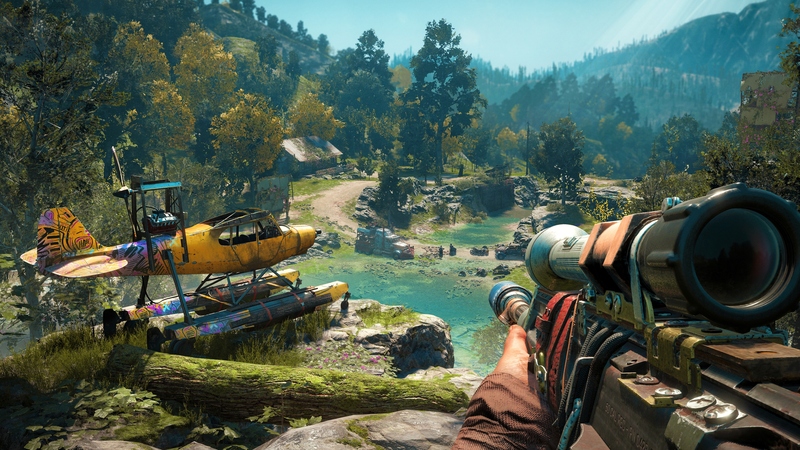 In Far Cry 3, there was Vaas and a new exciting world. Far Cry: Blood Dragon had everything that is Far Cry: Blood Dragon. Far Cry 4 had Ajay and Pagan Min, as well as a compelling world to play around in. Outside of Far Cry, Assassin’s Creed Origins also revitalised my interest in the series. Far Cry New Dawn? It’s looking to do the same thing. Much like previous standalone expansions, Blood Dragon and Primal, the map is very much taken from the core entry it follows. Yes, the map is taken, but then expanded on, to suit the new games theme. 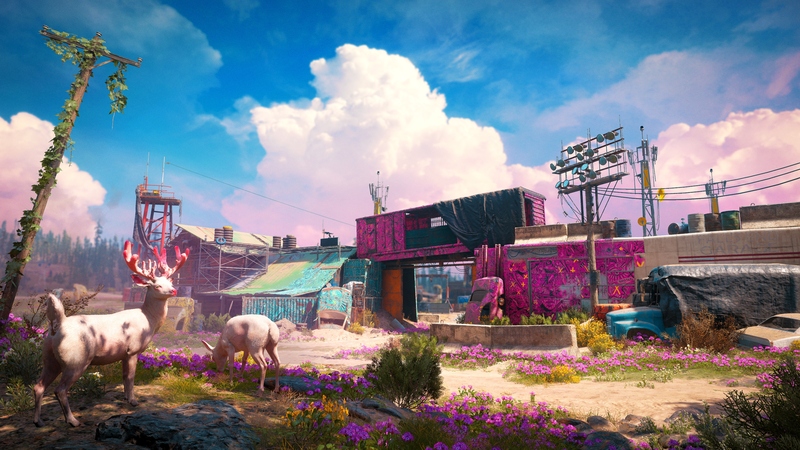 This isn’t the 80’s vision of a post-apocalyptic future, nor is it the beginnings of time, what we have here is a post-apocalyptic Hope County, 17 years post-apocalypse to be exact. This isn’t the Cthulhuesque world ruled by giant mutated Emperor Penguins that myself and a member of Ubisoft decided would be the perfect entry to Far Cry. However, New Dawn is certainly a great start – the radiation just hasn’t had time to sink in. Being post-apocalypse, a lot of what you knew in Hope County from Far Cry 5 is gone. Roads are now, at best, dirt tracks – long withered away by the passage of time and the dust-storms. Buildings, uninhabited, damaged and ruined. Nature has started to and is reclaiming much of what once was hers, giving the world a much more vibrant and wild feel. Particularly so when you see some of the areas that are considerably more beautiful to behold now than ever before. 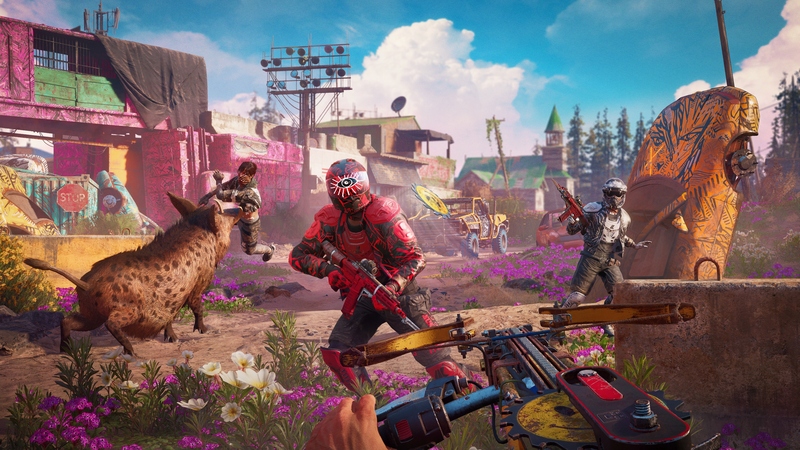 If there’s one thing that’s certainly worth pointing out with Far Cry New Dawn, it’s the use of colour. From the map itself, with bright greens, pinks, blues and every colour in between, to the enemies, you come across. “The enemies?” I pretend to hear you ask. Indeed! The Highwaymen, a band of thugs led by two twin sisters, do tend to have that stereotypical post-apocalypse look about them. Leather jackets, helmets, boots, whatever they can scavenge. 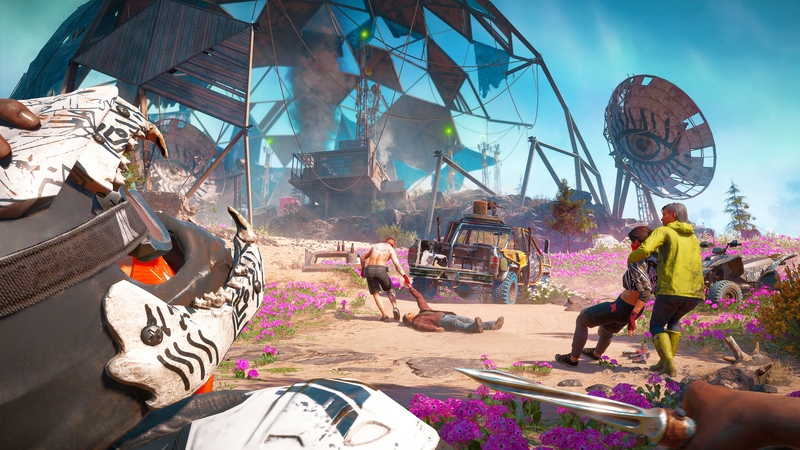 However, as a result of Far Cry New Dawn’s RPG elements, they are now ranked. The higher rank of an enemy, the more colourful they tend to look. Also, the more brutal they are. RPG Elements seem to be en vogue for Ubisoft at the moment, though that is with good reason. Following their successful inclusion into Assassin’s Creed, the move to Far Cry was to be expected. Here in New Dawn, you can look to find them permeating through Hope County. As previously mentioned, one aspect is found within enemy ranks. While you won’t find something as traditional as enemies ranking up alongside you – that still doesn’t happen – you’ll see more difficult enemies as you progress through quest chains or towards the end of an outpost battle. The higher their rank, there are three ranks, the more health they have and the damage they do. Needless to say, they can be pretty damn challenging. This could be because they’re trying to defend their outposts and other areas that they’ve occupied. Naturally so, they’re a group that wants to control everything and squash everybody else beneath them. What happens with these outposts is one of the more interesting aspects. Once you’ve conquered an area, you can hold onto it as normal and gain supplies from it, but you can also scavenge it to increase the supplies you gain but eventually leave it open to recapture by the Highwaymen. Capture it they will. Though then you have the option of recapturing it for increased rewards. All of these rewards all lead into the progression system that is put in place for the player, and the core crux of the new RPG elements. Prosperity is your new home after the opening story that causes you to be there – though you are essentially nameless, faceless protagonist. I understand the reason behind this, you’re inserting yourself into other people’s stories. Particularly the story of Carmina Rye, who you may remember as your goddaughter from Far Cry 5, who lives in Prosperity. Prosperity. The town has eight different facilities, as well as the overall town itself, to rank up to a maximum rank of three. Each rank unlocks new vehicles, equipment, weaponry and more for your disposal, provided you also have the supplies to craft them. In addition to crafting, higher ranks also unlock further missions that can even take you beyond the limits of Hope County. These moves outside of Hope County come in the form of expeditions. Fortunately, you know a guy with a helicopter and once you’ve scrounged up enough tins of baked beans and duct tape to fix it, you can get out of Hope County and take the fight to the Highwaymen elsewhere. The one expedition I got to try out is attacking an aircraft carrier that they had managed to capture. Your task is to steal some supplies from there. It was difficult and I was playing it co-op with one of the developers. Needless to say, I died. A lot. I also got eaten by a Shark. Oh dear. Though as you may expect, the wildlife of Hope County isn’t completely friendly. I’ve faced off against vicious Deer that kept running away from me, lulling me into a false sense of security. There also was an Alligator or Crocodile – I’m not sure – which scared the living hell out of me. Other horrible creatures like bears, bison and snakes are also just waiting to pounce and do their evil deeds. Maybe I shouldn’t have killed Bambi. Playing through Far Cry New Dawn for the three hours I got was more than a little fun. It was interesting attacking and scavenging from less important areas on the map, with them being highlighted once you’ve actually reached them. You scavenge the parts there, a satisfying tick appears, showing you’ve got what you need. Best of all, it encourages exploration. Still gone are the towers that have, for a long time, plagued open-world games like a bad case of the lice. Fortunately, as you explore, you’re also likely to encounter areas that offer treasure hunts, go hunting or fishing, track down locations based on photographs similar enough to Horizon: Zero Dawn’s Vantages. It’s a world that rewards exploration, particularly so when you unlock areas of Prosperity – even more so when you’ve managed to rescue/recruit the VIP’s around Hope County and bring them to your soon-to-be thriving settlement. Also, you’ll definitely want to capture supply drops sent in by the Highwaymen, as well as capture their supply trucks. Every little helps. As you explore, you’ll also gain perk points that further enhance your time in the game. Maybe you’re going to unlock the safe-cracking ability, maybe the grappling hook. Maybe you simply want to carry more ammo. That’ll be down to you. I can’t say if you’ll be able to unlock everything or actually have to pick and choose, but my gut tells me that if you explore everything, you’ll unlock everything. It’ll be invaluable when fighting too. As will Carmina Rye, or your multiplayer partner. Carmina, amongst other characters (and two animals), also act as Guns for Hire that you can bring in to fight alongside you. A Gun for Hire can’t be called in when playing with another person, but they are fantastic when you’re facing the hordes of enemies alone. You’ll definitely need them early on before you’ve unlocked and crafted some of the higher-end guns and weapons. These makeshift weapons are equally colourful as the rest of the game but very dangerous. There are a host of unique weapons that can be upgraded once you’ve crafted them. You can only carry a finite number of weapons at one time, but fortunately once crafted, they’re there whenever you want to swap out. As for upgrading them, you’ll never be able to upgrade a weapon to be more powerful than the equivalent one of the next rank up. The way the world is, as well as the expeditions, also encourage using a variety of these weapons and switching out as needed. To try and summarise all of this is a little difficult. 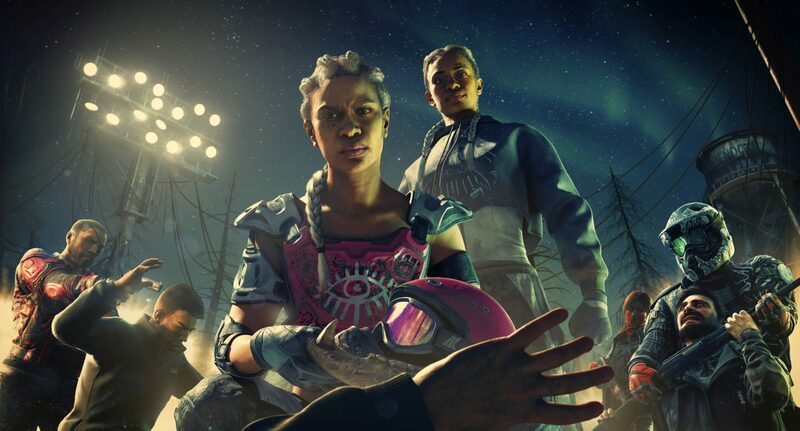 There’s a lot to talk about with Far Cry New Dawn. I certainly love the aesthetical choices, which are based in reality and called a ‘Super Bloom‘ rather than the usual bland, brown, apocalypse we’re used to in other titles. Introducing the RPG elements and also encouraging a larger focus on exploration introduces you to more of the world than ever before. In the version of the game I got to play, however, the map was limited. How much you can explore I can’t honestly say yet – I did wander into a radiation zone though, so they do exist. 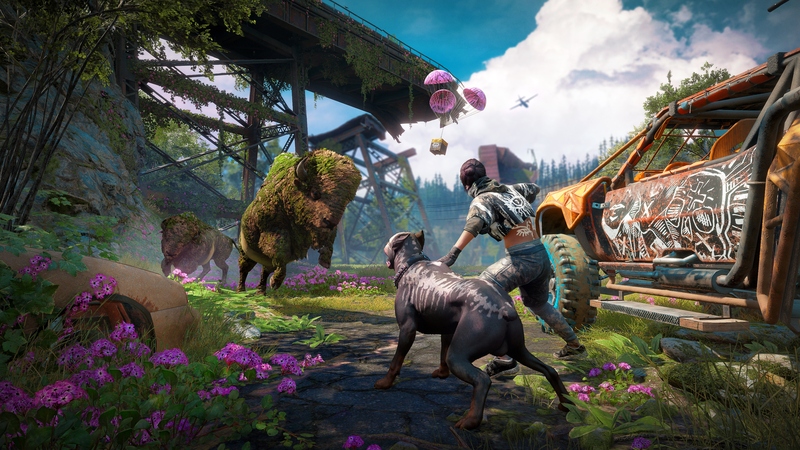 I could certainly come close to saying that Far Cry New Dawn is breathing a whole new life to the franchise. It’s certainly caught my interest more than any Far Cry since Blood Dragon, not only due to aesthetical choices but due to the expansion of what you can actually do in the game. I really enjoyed my time with it so all I hope is that the full game lives up to my heightened expectations. If it takes your fancy, as it does mine, you may also be interested in a deal that allows you to get the game for free.